After the last few weeks of mentioning signs of spring flowers a few readers have asked me to give more information about gorse which is one of the most fascinating shrubs in the Highlands. In the past it has had widespread uses and has had a role in myths and legends and a widespread use by man for food, medicine and numerous other uses. There are two old country sayings about the flowering of gorse ” While the gorse is in flower Britain will never be conquered” and the other is “When the gorse is out of bloom, kissing is out of fashion.” Patriots and lovers need not worry however because some blossoms of gorse can be found throughout the year. For example in January this year there were messes of gorse shrubs in flower at Fort George and, afterwards, as I drove inland the amount of gorse in flower dropped. This decline in overall flowering of gorse is because the overall temperatures decrease as you go inland. These days we get use to the idea of hay, straw and artificial feed being readily available for domestic stock and many other uses but it has not always been the case and people have had ingenious ways of coping. Many people will know that, for example, heather has been used as bedding, thatch and making ropes but perhaps fewer people will be aware that in the past gorse has had an important role for a variety of reasons. However, of all the uses the one the always intrigues me is that in the past gorse has been planted near croft houses and other houses so that washing could be laid on it to dry. With the very thorny branches of the gorse there was very little chance of the washing blowing away. But gorse, sometimes called whin of furze, can also cause problems as it burns fiercely so that heathland fires can spread rapidly making them difficult to get under control. However, there is another side to this as this ability to burn made it valuable as fuel when peat and wood was in short supply before the development of the coal trade. As it leaves very little ash it was also used in firing bricks, tile and lime kilns and also for fuelling bakers’ ovens. In contrast it has always been very useful as hedges or windbreaks for stock. Another economic use of gorse was as fodder for stock although only the young, tender and nutritious leaves could be used direct. Thus tender greener leaves are much used by wild animals such as deer, rabbits and wild goats to the extent it looks like hand cut topiary. 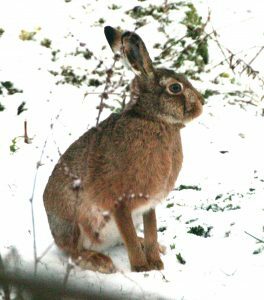 Brown hares, pictured here, really go for gorse when there is snow on the ground like last week. Otherwise the gorse had to be cut and then pounded to crush the hard prickles and in Scotland special machines were developed called whin bruisers and the more advanced whin mills. These mills either used a roller or wheel to crush the chopped gorse as it was fed into a channel. 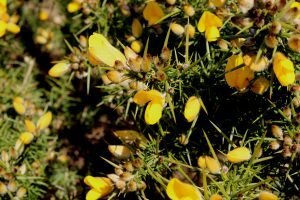 Gorse has also had a widespread use for ourselves such as a medicine made from the flowers that was supposed to cure jaundice and stones in the kidney. In contrast, gorse wine made from the flowers is still very popular and the flowers have long been used for flavouring whisky. If you look at some of the large expanses of gorse, such as on the Drummossie Moor just south of Inverness, you will get an idea how important such areas of gorse is to a range of wildlife. A wide range of birds breed here and a notable one is the stonechat.